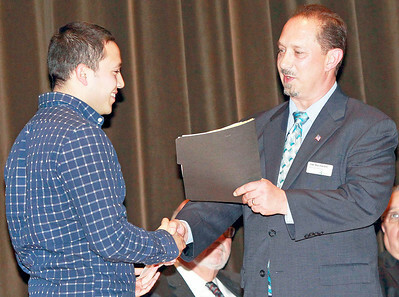 Candace H. Johnson-For Shaw Media Navy veteran Eric Soto, 25, of Waukegan, president, Student Veterans Club, shakes hand with Army veteran Joseph R. Bochantin, veteran student services coordinator, after accepting his club's role in hosting the Veterans Day Ceremony for next year, during the Veterans Day Ceremony at the College of Lake County in Grayslake. 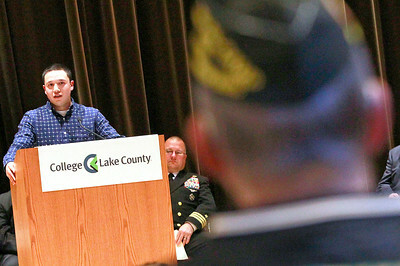 Candace H. Johnson-For Shaw Media Navy veteran, Eric Soto, 25, of Waukegan, president of the Student Veterans Club, gives the closing remarks as Kenneth "LT" Ruesch listens to him in the audience during the Veterans Day Ceremony at the College of Lake County in Grayslake. Candace H. Johnson-For Shaw Media Rachel Elan, Ben Smith and Katherine Kalinowski with the Navy Band Great Lakes play the "Armed Forces Medley" during the Veterans Day Ceremony at the College of Lake County in Grayslake. 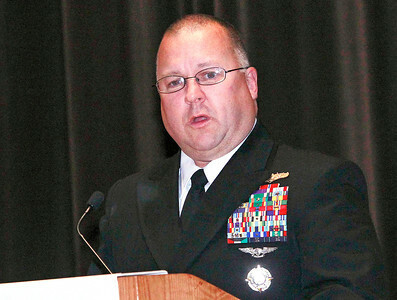 Candace H. Johnson-For Shaw Media Commander Brian Riegler, principal, Waukegan High School, and Commander, U.S. Navy Reserve, gives the keynote address during the Veterans Day Ceremony at the College of Lake County in Grayslake. Rachel Elan, Ben Smith and Katherine Kalinowski with the Navy Band Great Lakes play the "Armed Forces Medley" during the Veterans Day Ceremony at the College of Lake County in Grayslake.